This is the companion book for the exhibition of the same name, held at the American Art Museum from 16 March 2012 to 30 September 2012. The book title is quite broad, and maybe ambiguous. This isn't an art book with pretty pictures or concept art of video games. Rather, it's about the evolution of video game graphics, the artistry of making video games. All explained in a brief and simplified manner. Since this is an exhibition companion book, it's not surprising it's not that technical. I get the idea that the target audience are probably exhibition goers first and then gamers. I enjoy the sense of nostalgia from looking at the old games I used to play. As with any list that ranks games, there's always the surprise element when you see games you've never seen before. From the text, you get some brief insight into how the games came to be. I've several issues with the book though. The first is the selection criteria. 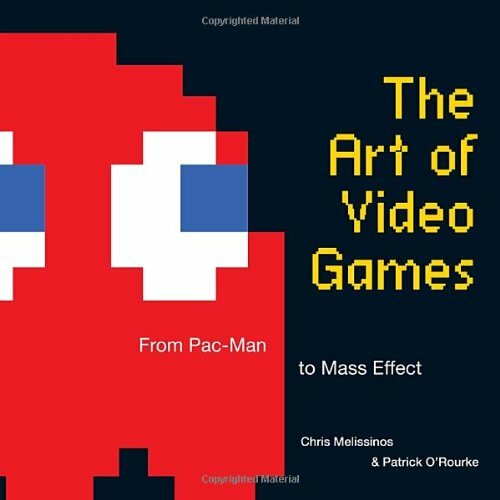 Author Melissinos selected an initial group of 240 games based on criteria that included visual effects, use of technologies and how world events and popular culture influenced the games. Then, voters online were invited to to choose the most popular games. Finally, 80 games are picked. In general, I don't expect the gamers to know anything about how the graphics were created, nor the technologies used in the game making. The public voting element goes against the selection criteria. At times, it's difficult to tell whether the games are included because they are innovative or just fan favourites. There are peculiar inclusions as well as omissions. A search online for bestseller lists will yield results for fan favourites instantly. The games are sorted by eras, starting from Atari's first game Combat in 1997 to 2009 with Flower developed by thatgamecompany. In each era, the games are strangely not ordered strictly to chronological order. The most recent game featured is actually Heavy Rain from 2010, before Flower as it appears in the book. Each game has a writeup of around 3-4 paragraphs on one page. That is too brief to cover the game history, design concept, game play and technology. The criteria for the included titles are there, but they aren't justified in the text. Games released around the same time usually are similarly impressive in visuals. For example, not mentioned was Valkyria Chronicles which has an unique hand drawn art direction. Okami was included though. Because it sold better? Screenshots are too few to give enough context on why each game is so visually spectacular. The included ones are not the best representatives of the games. The really old games are redrawn to look sharp, such as that on the book cover. New game graphics are still alright. It's those games in between that are bad as they cannot be redrawn, and don't have enough resolution to look good. I don't think it can be helped because of the nature of game graphics at that time but at least more should have printed at smaller sizes. If this book is about the art, I want to see more art from each game. Also included are interviews with some game makers. Unless they introduce themselves, you won't know their role or the company they work for. A one-sentence short profile is missing. Sometimes I only get the context of what they are talking about after reading halfway in. There are many other things I was expecting but not found in the book. There's no mention of games on handheld game devices, art direction taken by big games, newer ways of creating realistic animation like using motion capture such as in Uncharted 2, etc. Visual effects are limited by hardware but the book does not have any commentary on the systems that run these games. So there's no context on what's possible and impossible with each new hardware releases. There's also nothing about creating game music. But I guess we're talking about visual arts rather than the art form of games. Gamers will expect more from the book. It lacks the breath and depth to cover a subject as vast as video games. It doesn't help when there are no compelling justification on why some game titles are included. Overall, a missed opportunity.